When I posted the picture for these english madeleines on instagram I mentioned that my house smelled of my childhood. And it surely did. In fact when I was washing the cupcake pan, it still smelled of the memories from my younger days, even though the madeleines had been removed and set aside a while back. , my mom used to make them shaped like a regular cupcake- since she did not own a dariole mould. And then bathed them in jam and desiccated coconut. So I made them the same way in cupcake pans- not because I do not own dariole moulds (I actually don’t) but because that’s they way I remember english madeleines to be.English madeleines are different from their counterpart French madeleines. 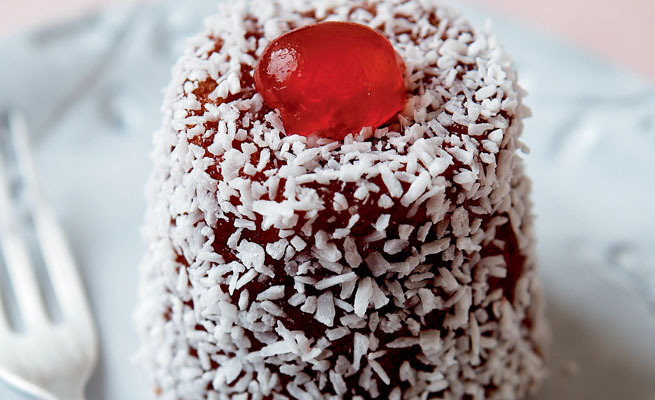 While the french make the their sponge cake in a shell like shape, the english smother it in jam and roll it in coconut, losing the shell shape for a more cone like shape. This recipe has been in our family for 20 plus years now, my mom got it from a UK edition of the Good Housekeeping Cakes and Pastry Cookbook. I remember going through this cookbook as a child and then later when I was in college, and now that I am baking in my own home I asked my mom to lend it to me. There is a lamington recipe that my mom made from this book as well. Hopefully I will get to share that recipe with you guys soon. With things a little busy at my end I was thinking of posting this recipe later, but after V told me how a colleague came to his office asking for the recipe, I decided to post this sooner than later. And what better testament to how good something is than someone coming to you (or your husband) later and asking for its recipe. Preheat oven to 180 C or 350 F.
Grease ten dariole moulds ( or a muffin tin- I got 9 cupcake shaped madeleines from my batter). Cream butter and sugar and beat till pale and fluffy. Fold in half the flour, using a tablespoon. Fold in rest. Scoop the batter into moulds or muffin pan, filling them three-quarters full. Bake for 15-20 minutes until well risen and tester comes out clean. When the cakes are almost cold, (If you have used dariole moulds trim the bases so that they stand firmly) brush each cake with melted jam all across. Then either with the cake speared on a skewer or fork, roll the cakes in coconut to coat. Top each madeleine with half a glacé cherry.